We are thankful to the archivists at the Ottoman Imperial Archives for digitizing and posting vintage pictures from Palestine on their website. On July 14, 2015, this incredible painting was posted. Note the Jews' lamentations. 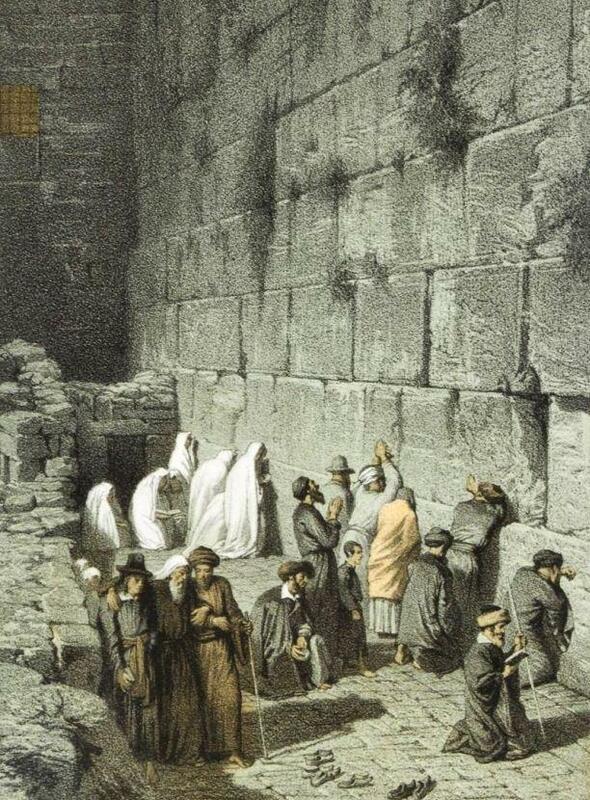 They are barefoot (their shoes are in the foreground), suggesting that the scene may be commemorating Tisha B'Av, a day of Jewish mourning for the destruction of the Jewish Temples and other calamities in Jewish history. The painter, Johann Martin Bernatz, was born in Germany in 1802. He traveled in the Middle East and Asia in 1836 and published 40 pictures from his journey in a book, "Pictures from the Holy Land, Drawn from Nature" in 1839. We suggest that the painting was painted 30 years prior to the year in the Archives' caption.